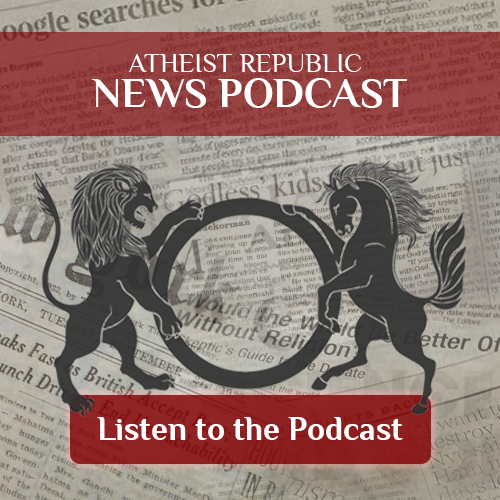 Atheist Republic is your source for news that matters to the atheist community. Atheist news articles and other relevant current events are provided here, written by our team of journalists. We compile and write concise reports on important news from around the globe. We are always looking for more writers to join our team. Priest repeatedly addressed the Roman Catholic Church's stance on suicide during a teen's funeral, making his parents' grief even worse. While homosexuality was already illegal in Brunei, new radical Islamic laws are introducing stoning to death as a punishment. Ohio has a new law, the so-called "heartbeat bill" that makes abortions illegal as soon as the fetus' heartbeat can be detected. The Supreme Court blocked the execution of a man who argued his religious freedom would be violated if his spiritual adviser couldn't accompany him. Who Supports LGBTQ Civil Rights The Most? According to a new research, support for LGBTQ civil rights is the highest among atheists, agnostics and Unitarians. A case from Morris County, New Jersey, that could have allowed churches to use taxpayer funds for renovation, wouldn’t be heard at The Supreme Court. Despite the majority of population identifying themselves as religious people, there are instances of wrongdoing and injustice that take place in the world every day, and ironically, most of it is carried out in the name of religion. From homosexuals being persecuted to innocents being murdered, from women being subjugated to children being exploited, the list goes on endlessly. However, for several reasons, some that are obvious and some that are not, these tragic stories do not receive the kind of media coverage that they deserve. That is why at Atheist Republic, an arduous team of bloggers, journalists and editors from across the world find stories related to atrocity, conflict, abuse and inequality and attempt to throw some light on these matters. Despite their core belief in atheism, the team focuses on issues that go far beyond the mere rejection of the existence of deities and archives stories that are for those people who refuse to live within their bubbles and care enough to learn the whole truth about the world at large. Just because atheism does not find place very often in the media, that does not mean that there isn’t much that is taking place regarding the same. In fact, there is something worthwhile occurring every passing moment. If you are curious to know what is happening to atheists world over and what is being done by those who claim to be religious, Atheist Republic is the one place on the web that will share with you all the stories you need to know. In addition, you can also participate in discussions related to religion and politics on our website while keeping yourself updated with what fellow atheists have to say.